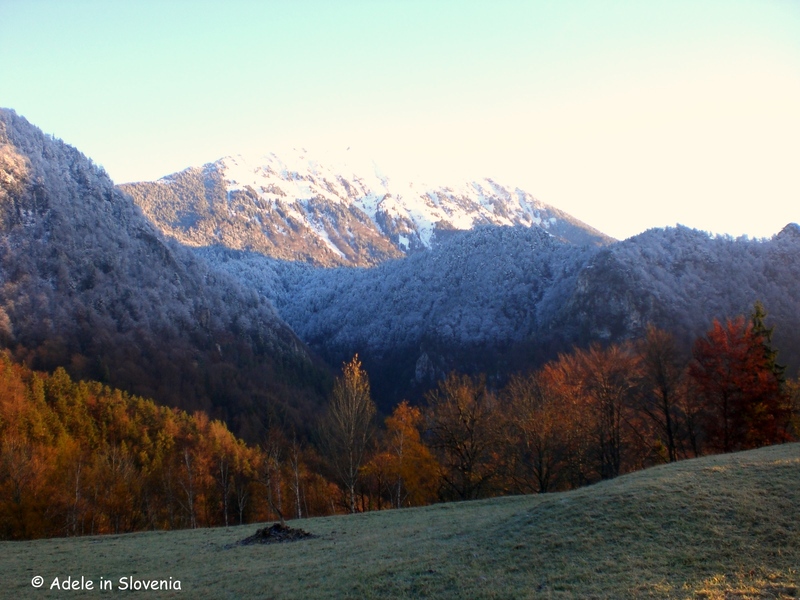 The early bird catches the early winter of 2016! Winter seems to have come early this year and, though the snow might look beautiful, I can’t say I’m ecstatic about it! 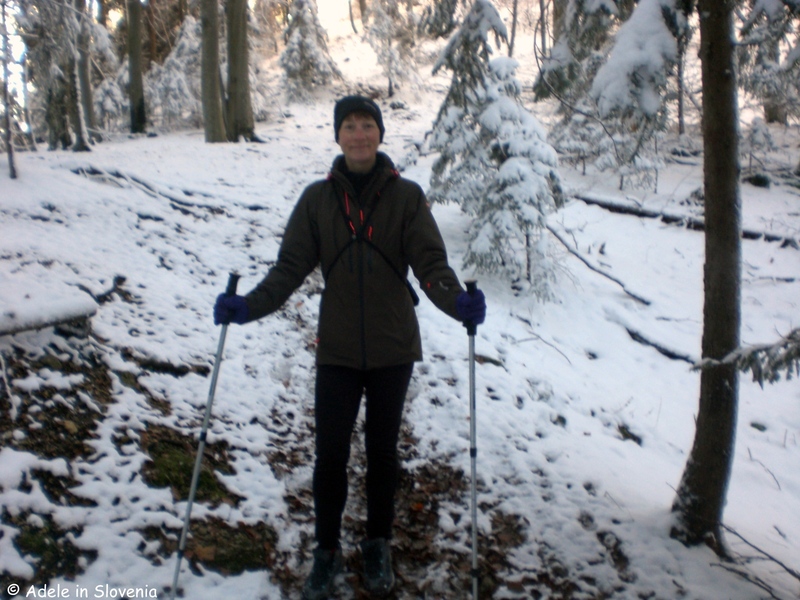 The past 2 years we haven’t had any significant snow until after Christmas, but last week’s dismal weather brought quite a significant amount of snow to higher-lying areas, and even a bit of the white stuff fell in lower-lying areas too. 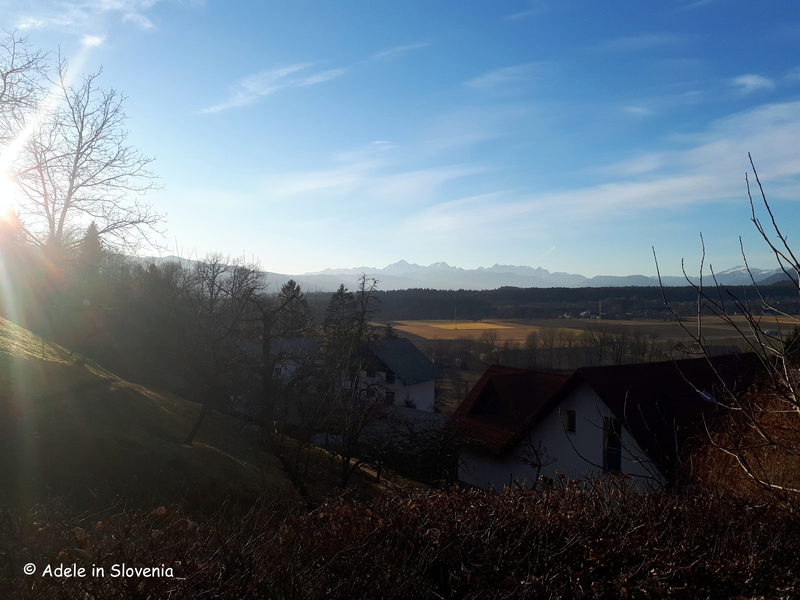 So, in an attempt to once again get accustomed to winter, I was up with the lark and braved freezing early morning temperatures to head up St. Peter’s Church above Begunje na Gorenjskem, just 10 minutes drive from Radovljica. Though its not easy to drag myself out of bed when it’s so cold and dark, the rewards are (usually!) worth it, which was certainly the case this time, as you can see below! 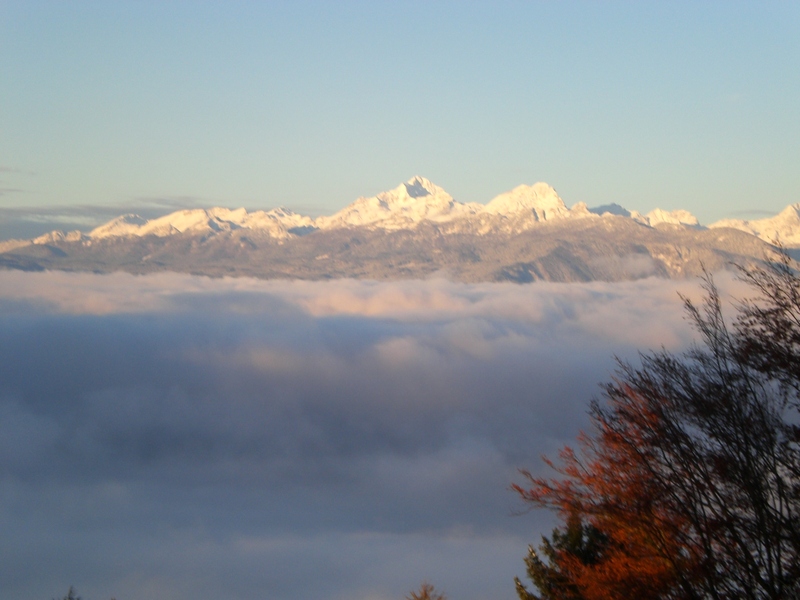 The valley was still shrouded in low cloud and Triglav and the other peaks of the Julian Alps were looking particularly majestic. 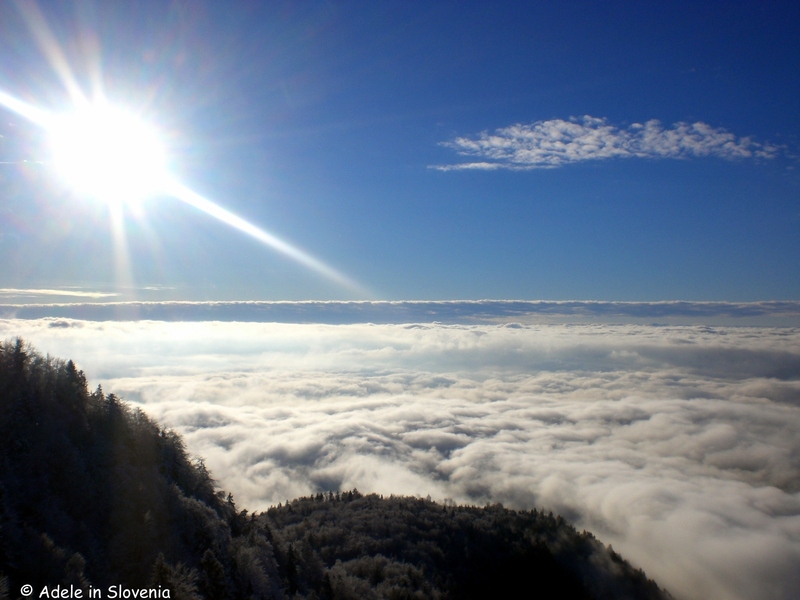 I continued up to Smokuški vrh. And this was my reward. Brilliant, warm sunshine and stunning views. It was tempting to linger there for a while, alas, the pile of translating awaiting me at home was ever present on my mind. But, I’d go, and will go, again in a heartbeat, even if it means an all-to-early start to the day! 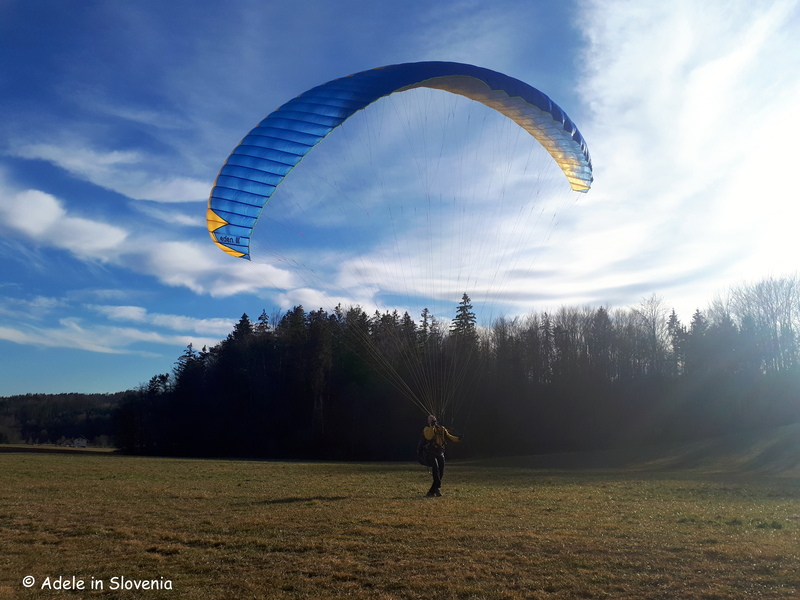 A case of the early bird catches the worm and the early winter and all that…! 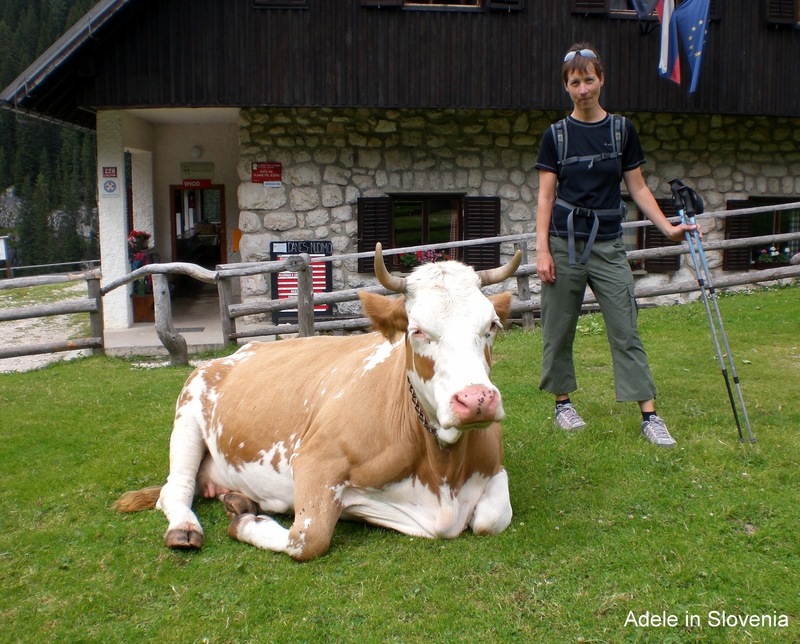 Highlights of Triglav National Park! 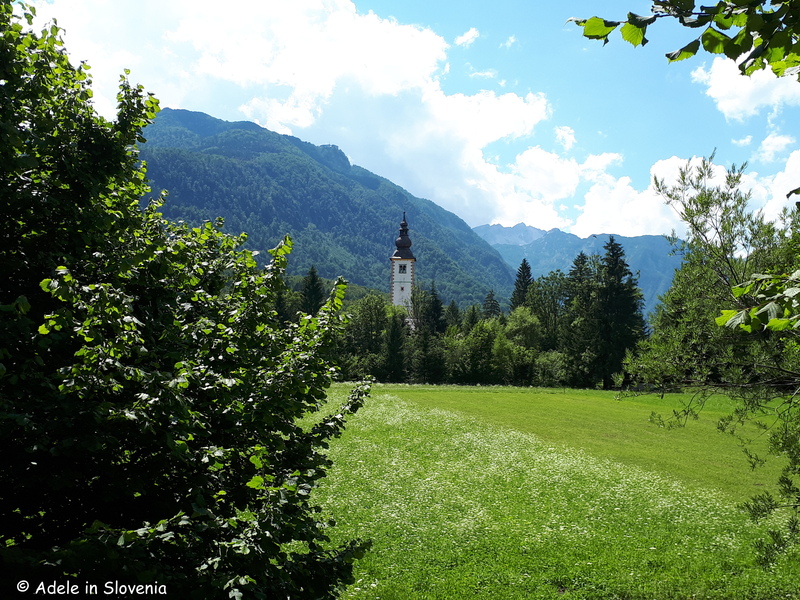 In this blog I’d like to show you some of the highlights of Triglav National Park, including some of my personal favourite parts, which will hopefully provide some ideas and inspiration for those interested in exploring this wonderful part of Slovenia. 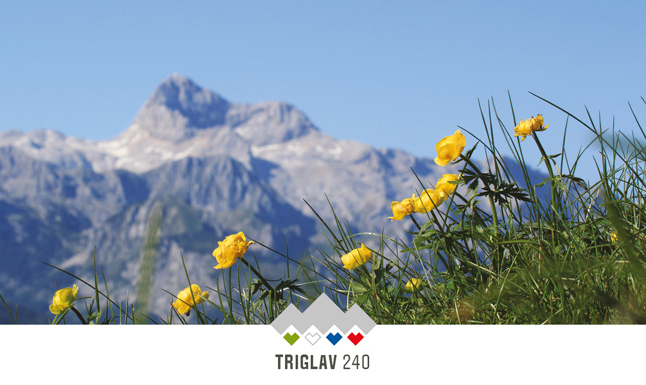 Triglav National Park is Slovenia’s only national park and is the heart of the Julian Alps. 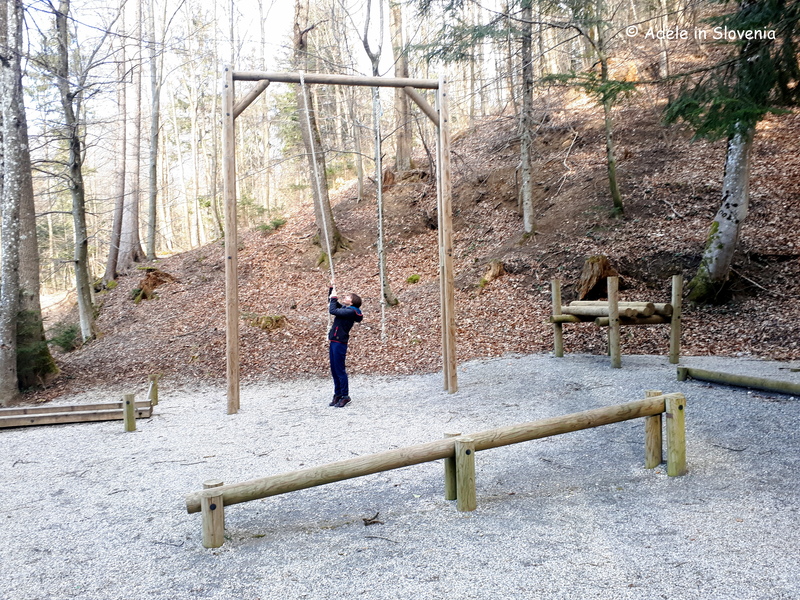 The park is located in the north-western part of Slovenia and is named after the country’s highest mountain, Mt. 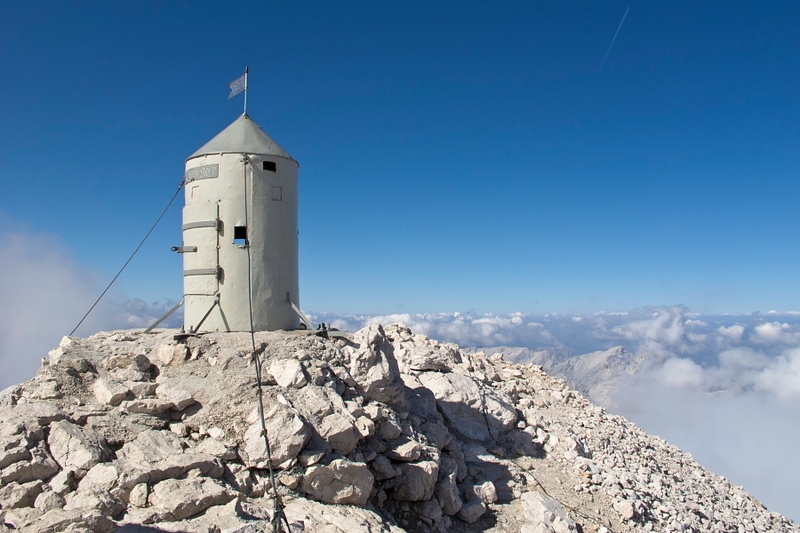 Triglav (2,864m). 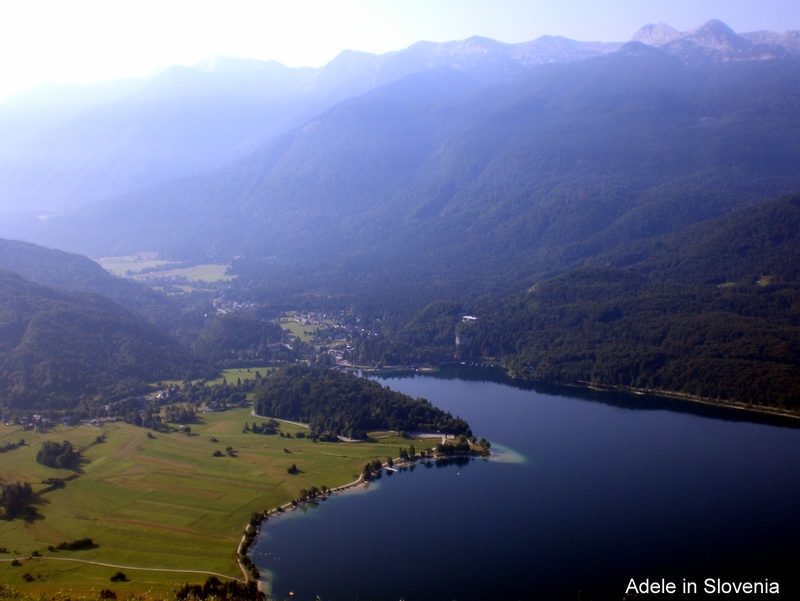 It covers an area of over 83,000 hectares. 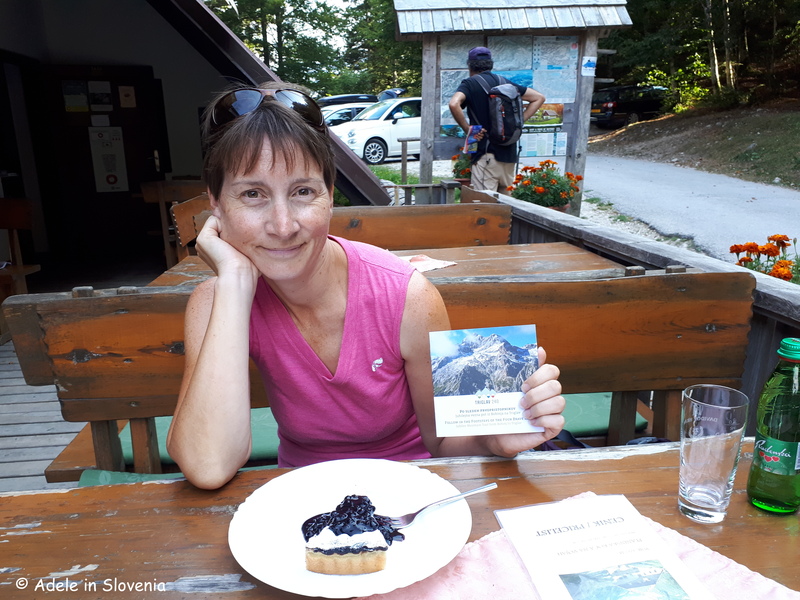 On my blog I have always strived to ensure I give readers a personal account of my adventures and experiences in Slovenia, rather than just regurgitating information which is already readily available. 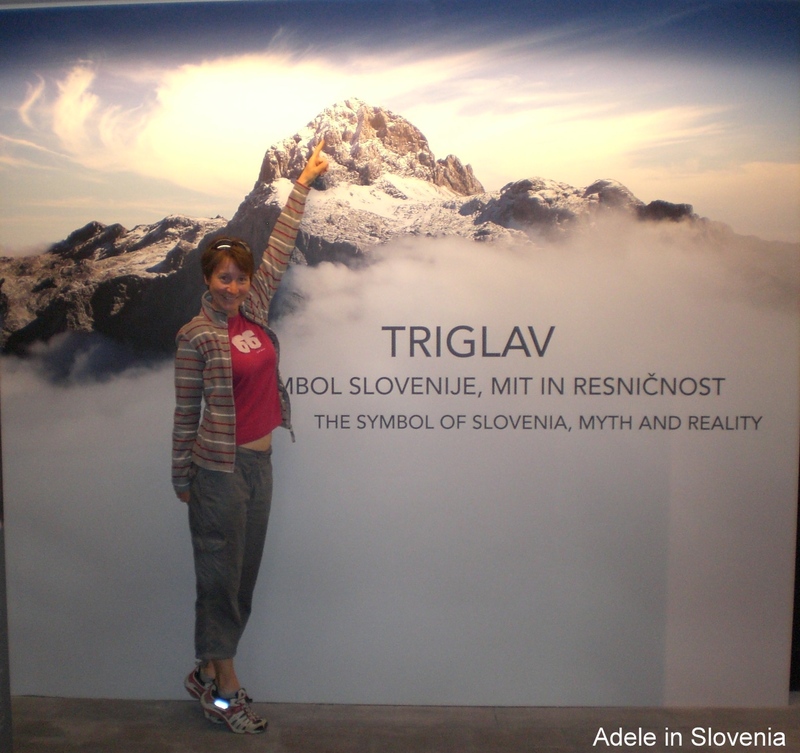 Therefore, I’m not ashamed to admit that I’ve never actually been to the top of Triglav, though I’ve been close! 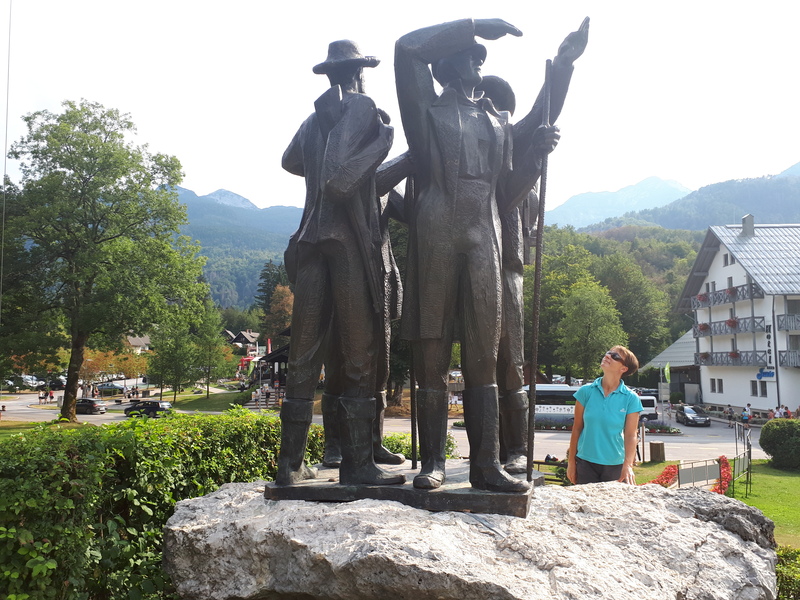 Unlike in some national parks, there are no official entry and exit points to the park, and no entrance fees to be paid. 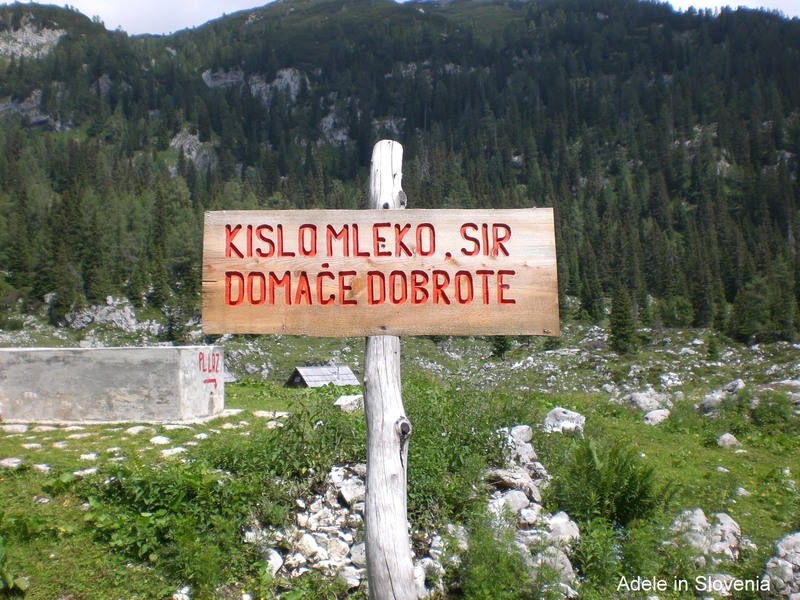 However, there are some rules by which visitors must abide to protect the flora and fauna of this jewel of nature. 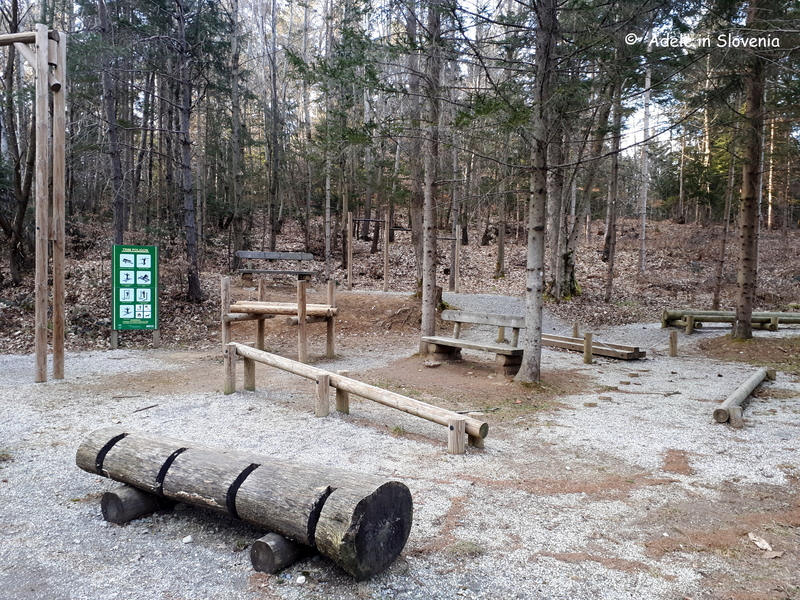 For example, wild flowers are not to be picked, no fires may be lit, and camping anywhere within the park, other than in designated campsites, is strictly forbidden. 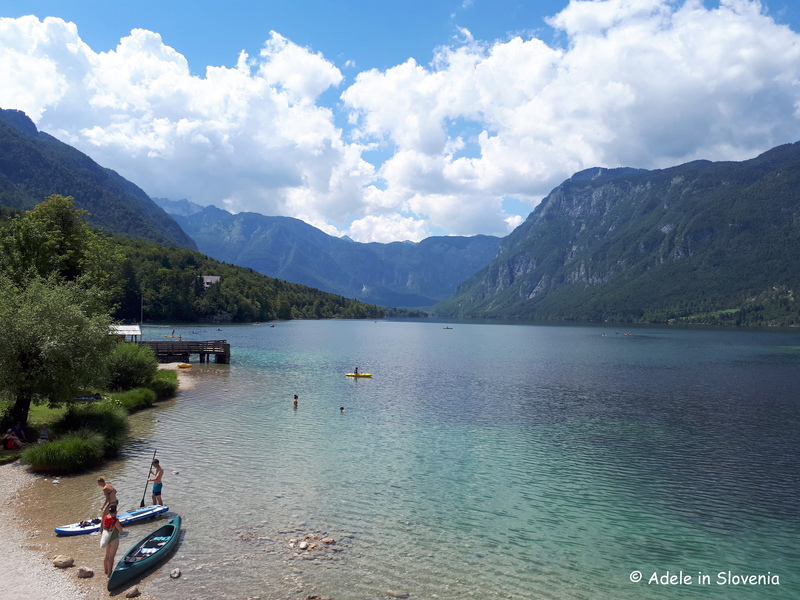 One among my many favourite parts of Triglav National Park is Krn Lake (1391m) – as seen below, with Mt. 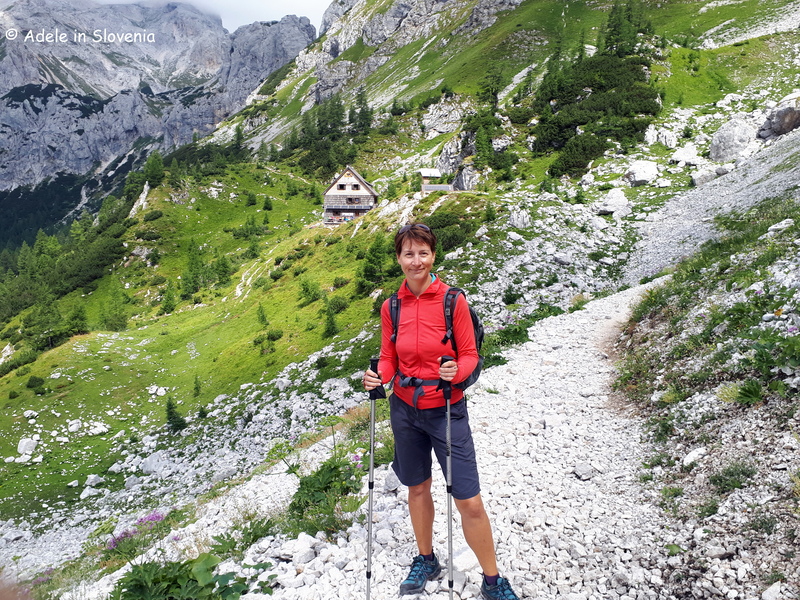 Krn (2244m) in the background. 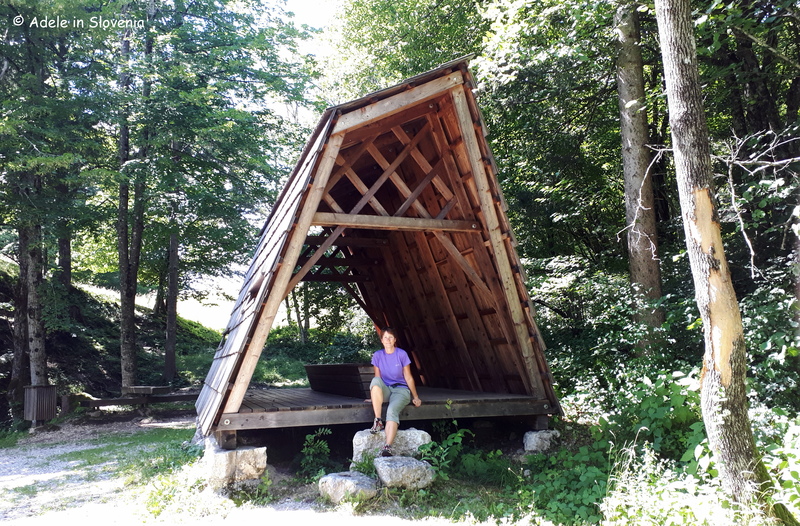 For this trip I started from the car park at the Savica waterfall in Bohinj and walked up to Komna (1520m), onwards past the Koča pod Bogatinom hut to the Vratca saddle then descended to the Dom pri Krnskih jezerih hut (1385m) where I stayed overnight. The next morning I got up (very!) early to hike up Mt. 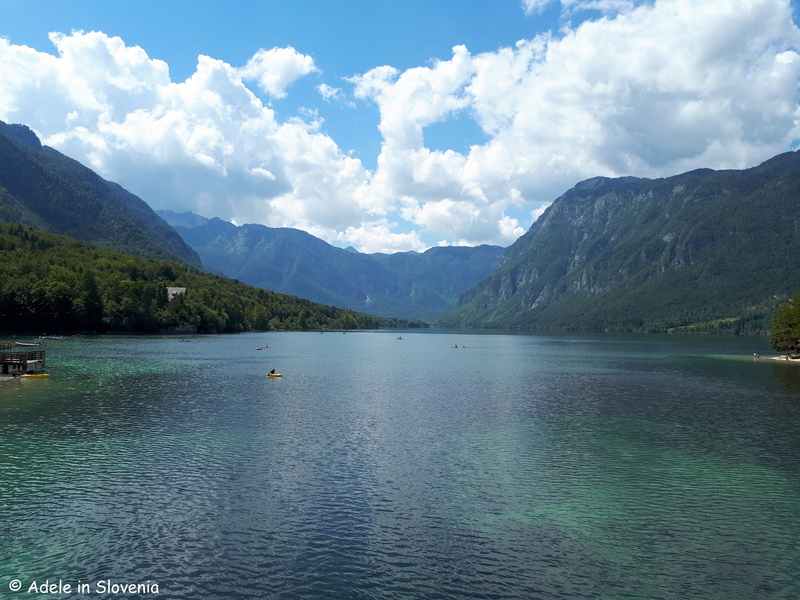 Krn, then returned the same way back to Savica. 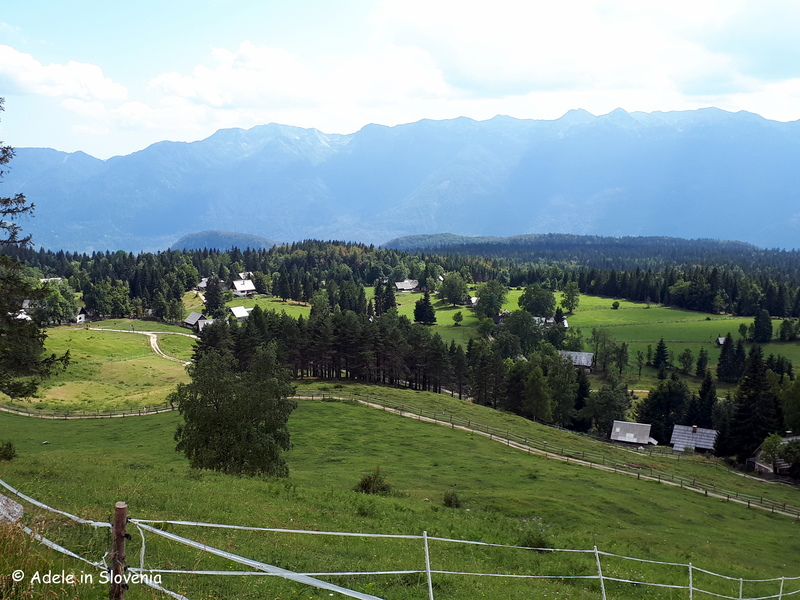 It makes a long 2nd day but the scenery is so wonderful, and other than the climb up to Krn, its reasonably easy going. 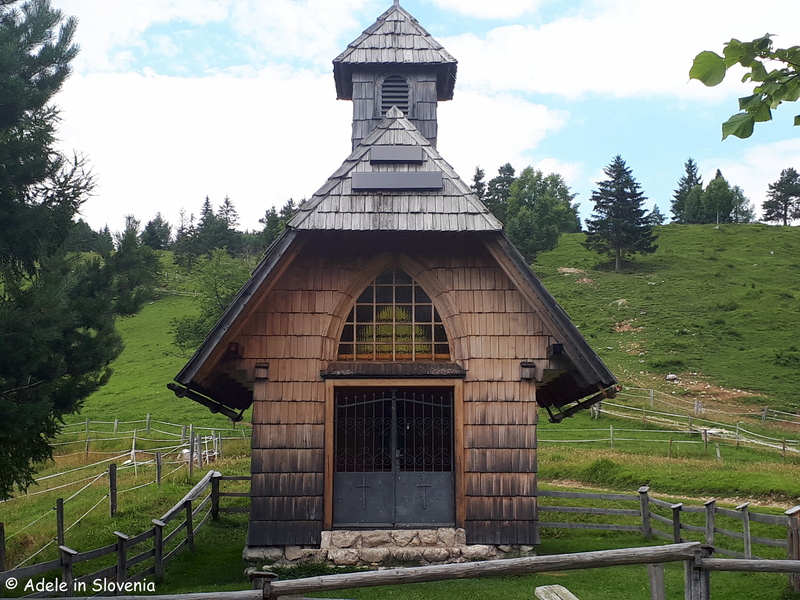 If you don’t need to return back to Savica, then you can instead take the path down to the Dom dr. Klemena Juga hut (700m) in the Lepena valley from where you can explore the beautiful Soča valley. 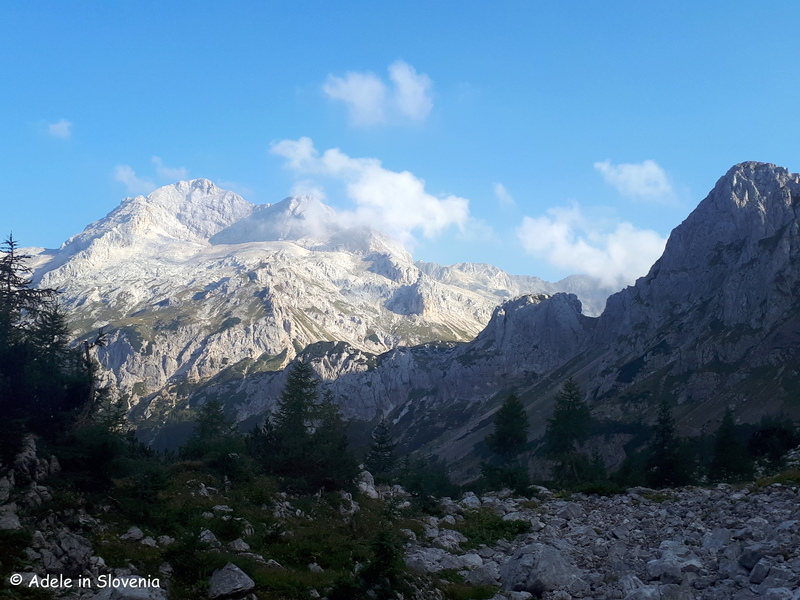 The picture-postcard pretty Planina pri Jezeru highland is another of my favourites and the options for reaching it are numerous. 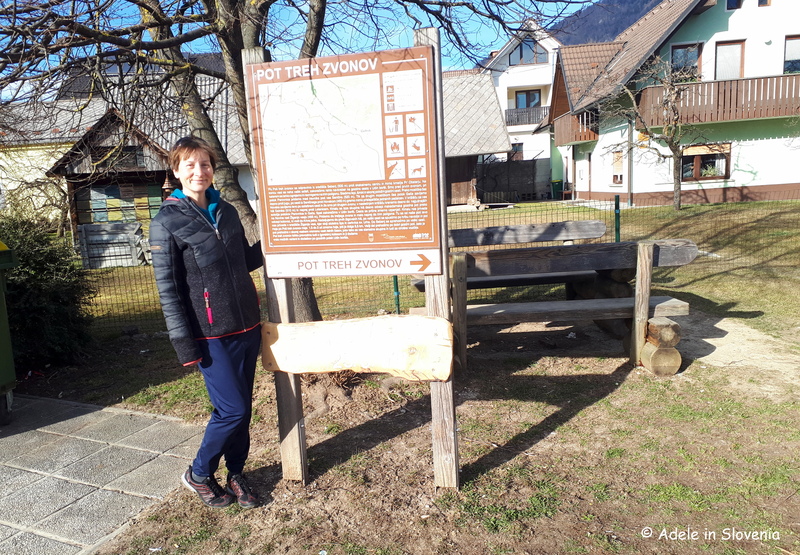 I like to start from Stara Fužina and walk first to Vogar, from where there are magnificent views over Bohinj lake and the surrounding mountains, then past the Kosijev dom na Vogarju hut (1054m). 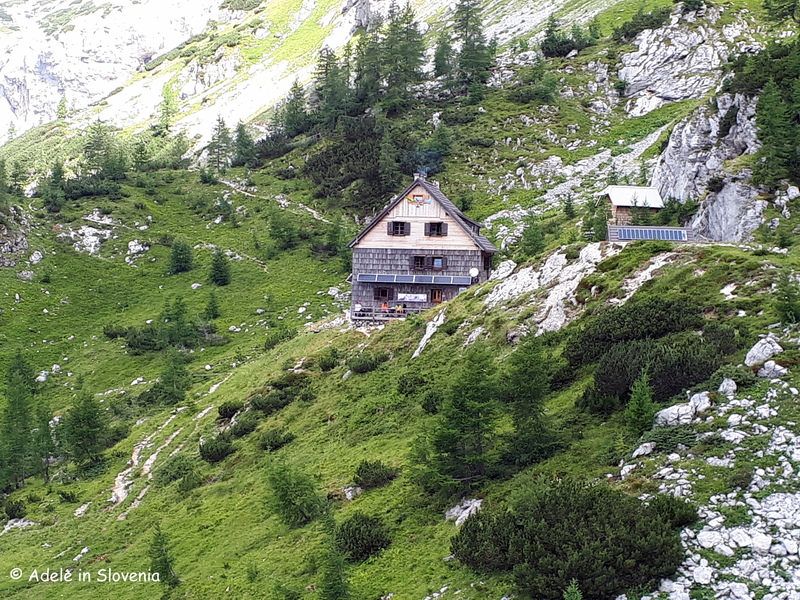 On this hike I continued first towards the Planina pri Jezeru hut (1453m) but then branched off towards Planina Blato (1147m) then to Planina Laz (1560m) – the oldest highland in Slovenia. From Planina Laz a very pleasant almost level route leads to Planina pri Jezeru from where, after a break for some sustenance, I returned to the Vogar highland and back to Stara Fužina. 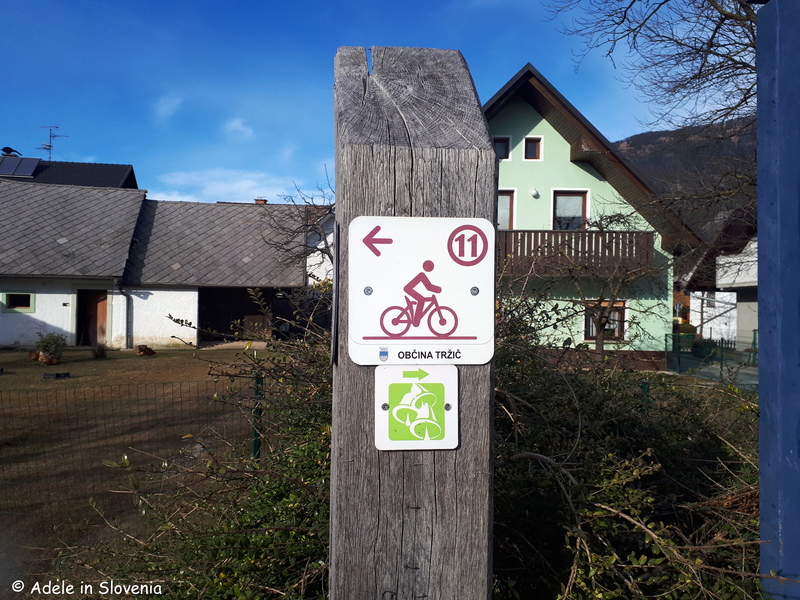 There are, however, also several other alternative routes that I have also taken, such as via Planina Viševnik and onwards to Pršivec (1761m). 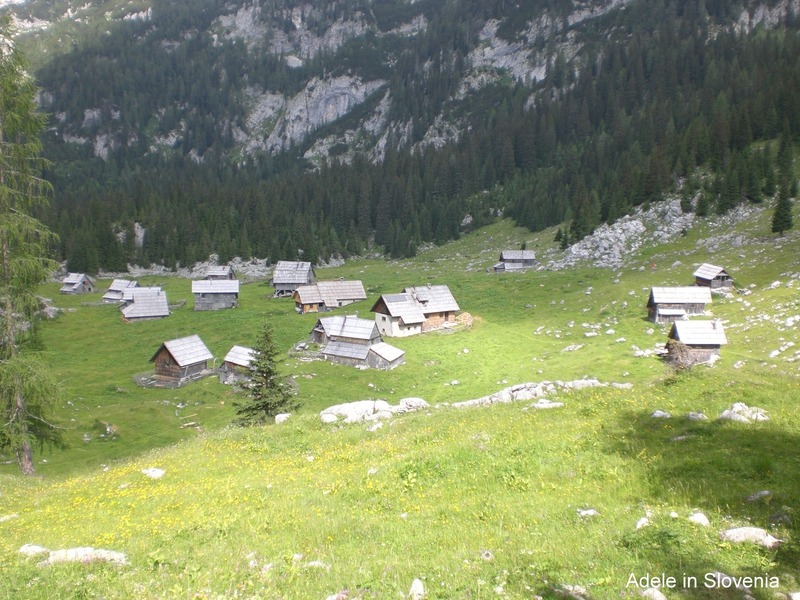 Planina Laz is on part of the Tourist Cheese Route (Turistična sirarna pot). 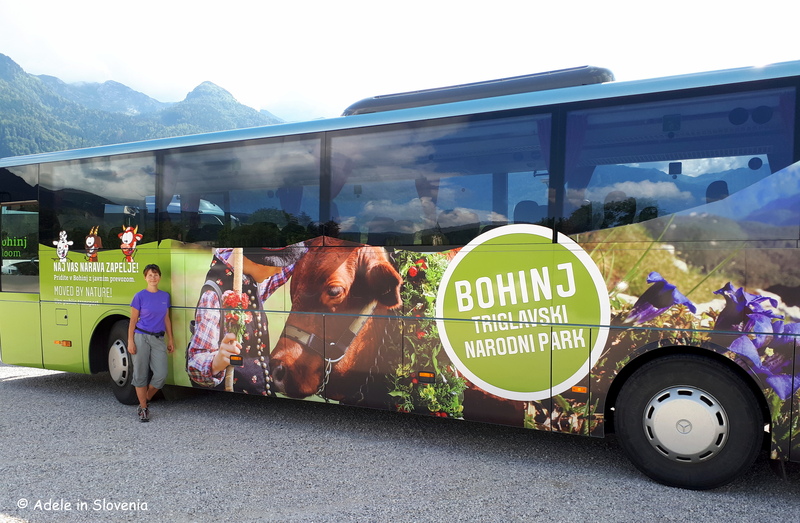 The route leads across the many highlands in the Bohinj area where cheese and other dairy products can be sampled and bought. 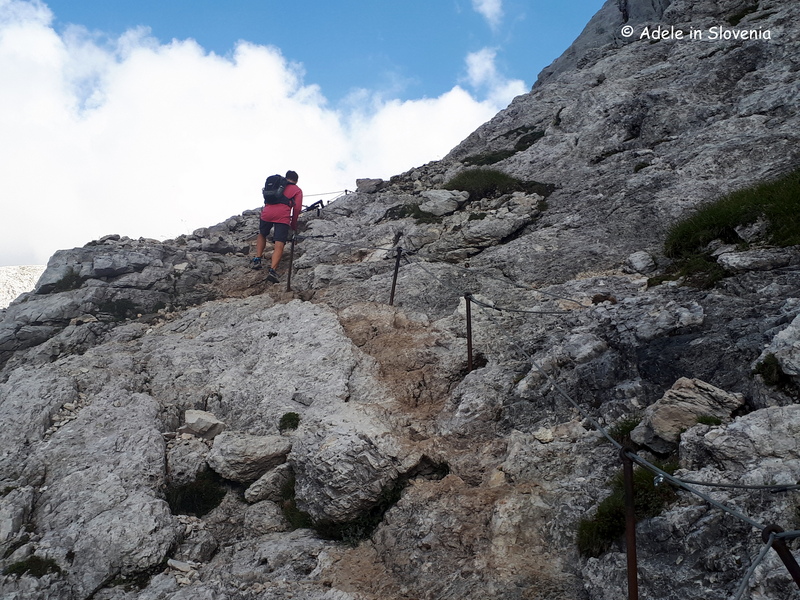 The route, which is marked with yellow signs, also leads past numerous natural features of interest such as gorges, waterfalls, museums, churches, and archeological sites. 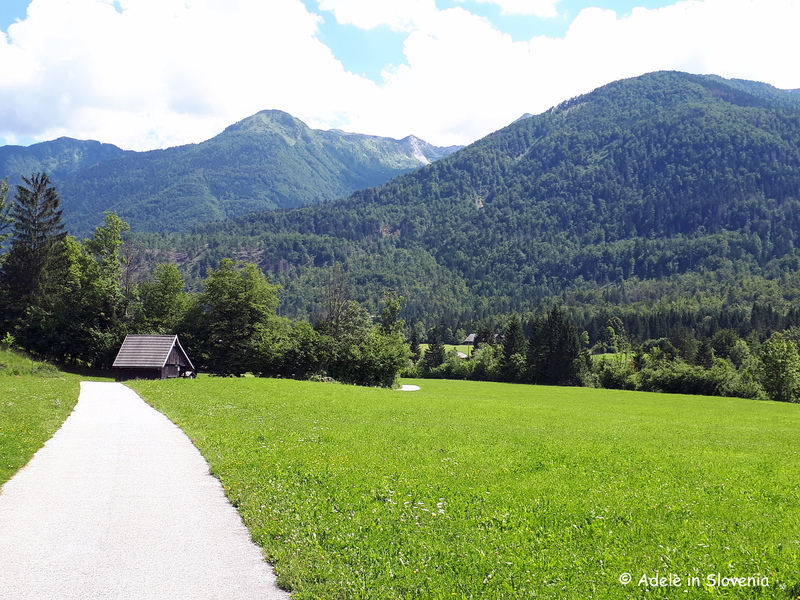 The path covers a very wide area so its not possible to walk it in its entirety (at least not in a day), so it’s best to just choose part of it and visit one or two of the highlands and dairies. 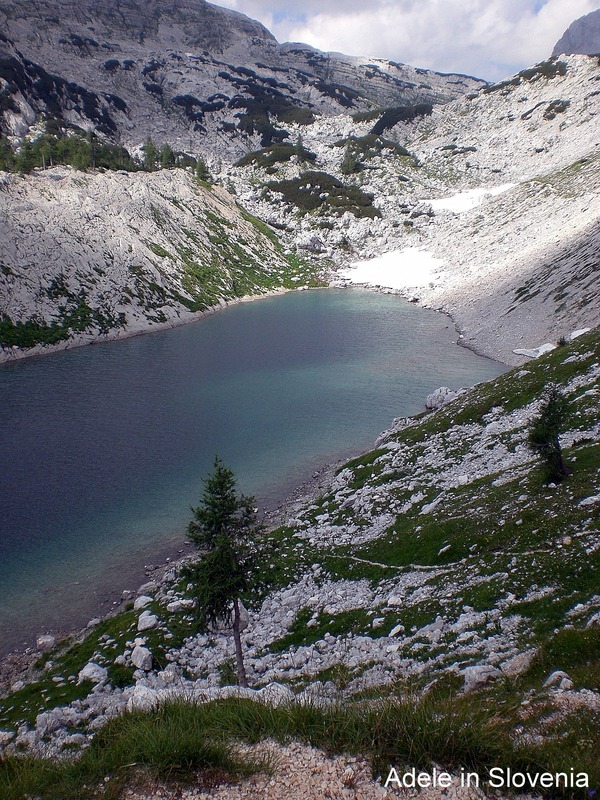 One of the most popular destinations for hiking in Triglav National Park is the Seven Triglav Lakes Valley. It is doable in a day trip, particularly if you drive up the toll road, saving yourself approx. 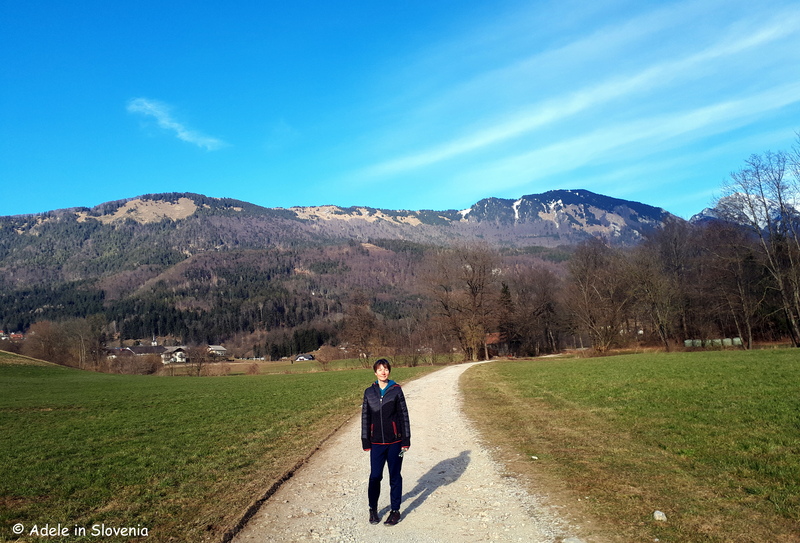 1.5 hours of hiking, to begin at Planina Blato. 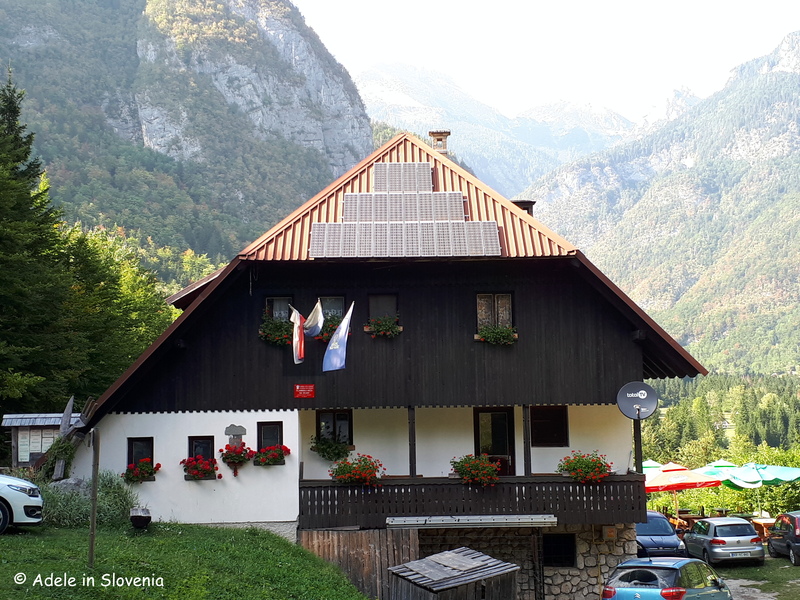 However, to have time to fully experience and appreciate the entire length of the valley, it is best to stay at least one night in a mountain hut, such as the Koča pri Triglavskih jezerih (1685m), where you also get a chance to soak up the atmosphere of the surroundings, enjoy some hearty homemade food, and chat to some fellow hikers. As you can see, there’s no shortage of routes to choose! Wherever you see signs such as this one, you can buy home-produced cheese, sour milk, and other highland treats! And you can certainly see exactly where it comes from. There are no food miles here! 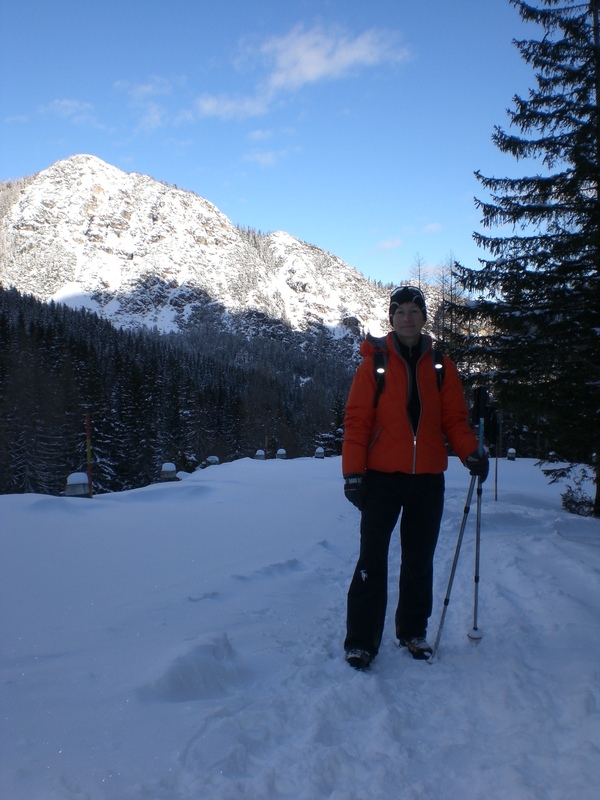 Provided you have a map of the Julian Alps it is very easy to put together an itinerary for day, or multi-day, hikes. 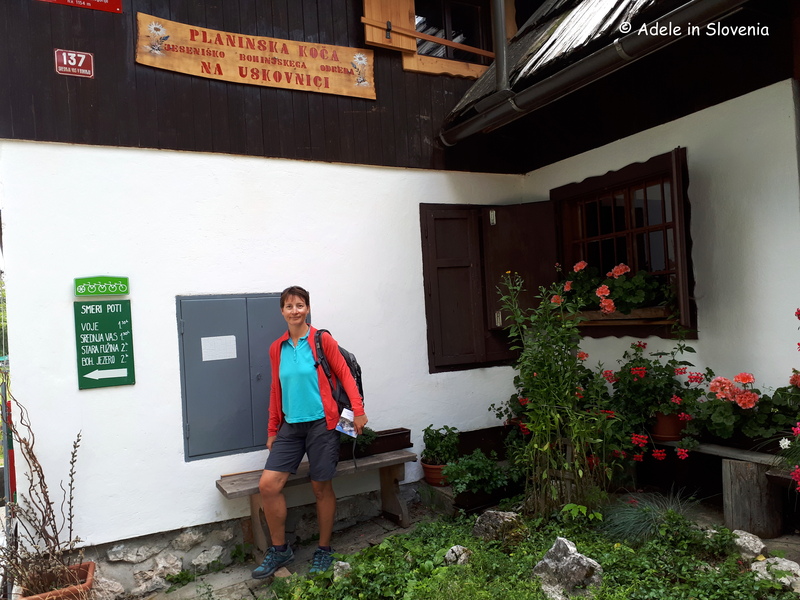 Routes are generally well-marked and there are plenty of mountain huts where you can overnight, though in the summer months I’d recommend booking ahead for the most popular huts – you wouldn’t want to hike all that way to find yourself without a bed for the night! 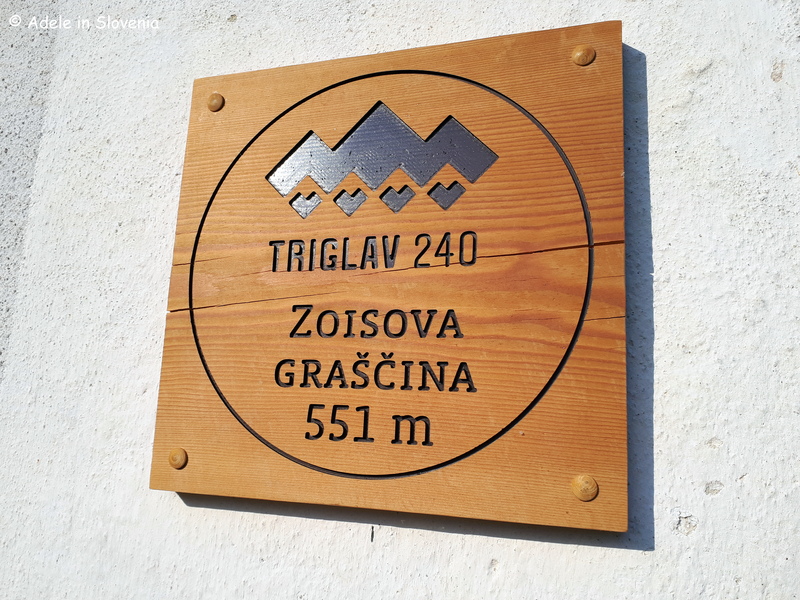 Triglav National Park awaits – time to get exploring! 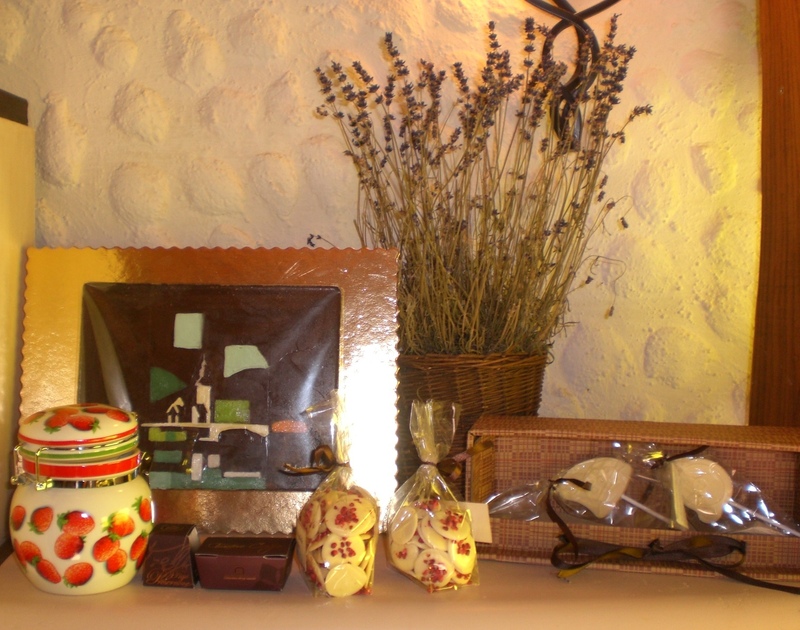 Easter Snow, Easter Food, and Chocolates Galore at Coko-Hram! We may not have had a White Christmas, although the first snow of the year arrived on Boxing Day, however, this Easter was marked by abnormally cold and wintery temperatures. In fact, this past few days we’ve really had it all weather-wise; on Friday I was sitting outside a café in the sun drinking tea; on Saturday I was walking in the rain with my umbrella; on Sunday I was gazing out of the window at falling snowflakes and now, as I sit writing this on Monday, there’s another flurry of snow, well almost a blizzard actually combined with gusting winds. Winter certainly had the final say this Easter! 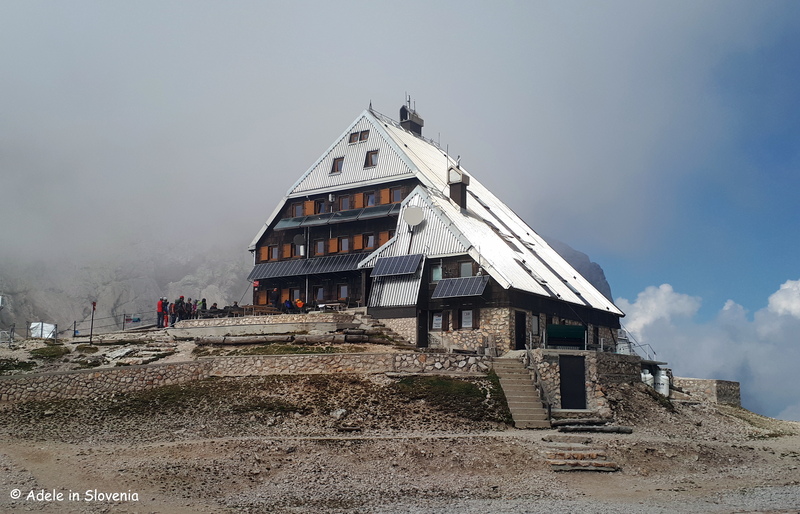 I read an interesting comparison yesterday of the temperature recorded at Kredarica, the mountain hut beneath Slovenia’s highest mountain, Triglav (2864m), where, on Christmas Day the temperature was +2.9 degrees, whilst on Easter Sunday it was MINUS 12, brrr…….. 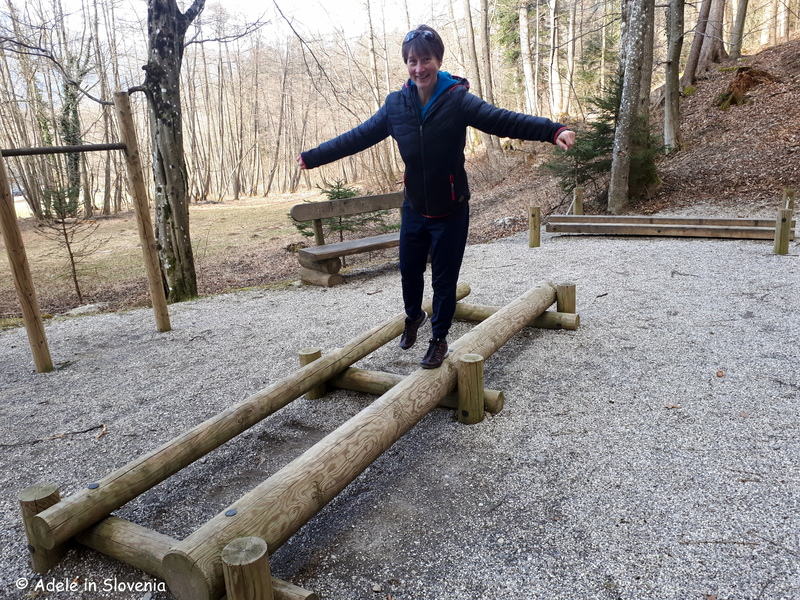 Thus, any plans for long hikes this weekend were scuppered and therefore my next love – food – was high on the agenda instead! 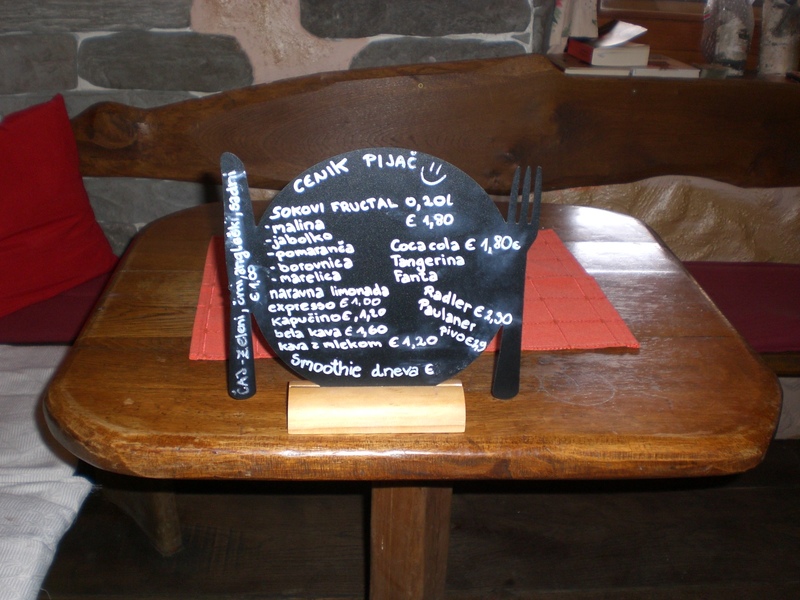 Food is a big deal in Slovenia at Easter. The most common tradition is for a family breakfast on Easter Sunday, consisting of baked ham with fresh horseradish, pirhi (coloured hard-boiled eggs) and, of course, potica (a rolled filled cake). 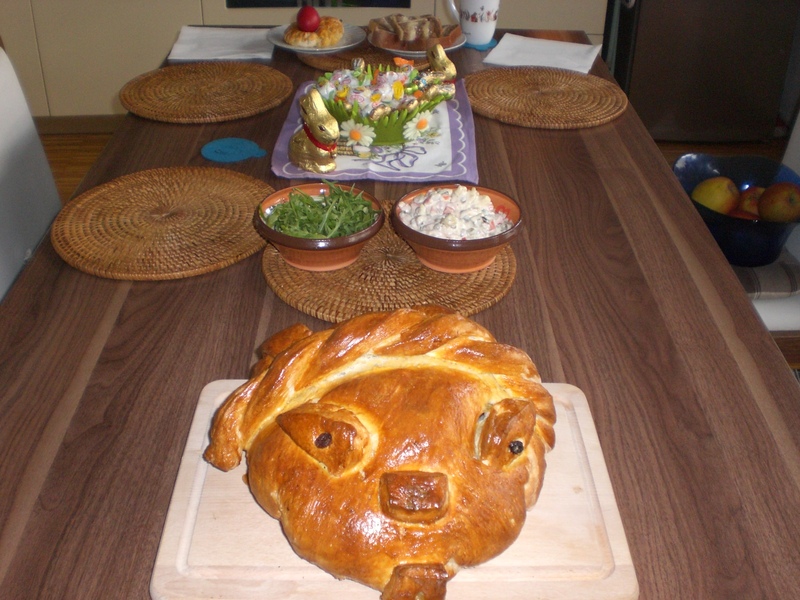 As I have been asked to write as a guest on an American food blog – what an honour – this year I decided to do some Easter baking of my own and am rather proud of my first attempts at ‘šunka v testu’ – ham baked in a bread crust. Here is a sneek peek photo of my Easter table and I will post the link to the full blog when it is published. 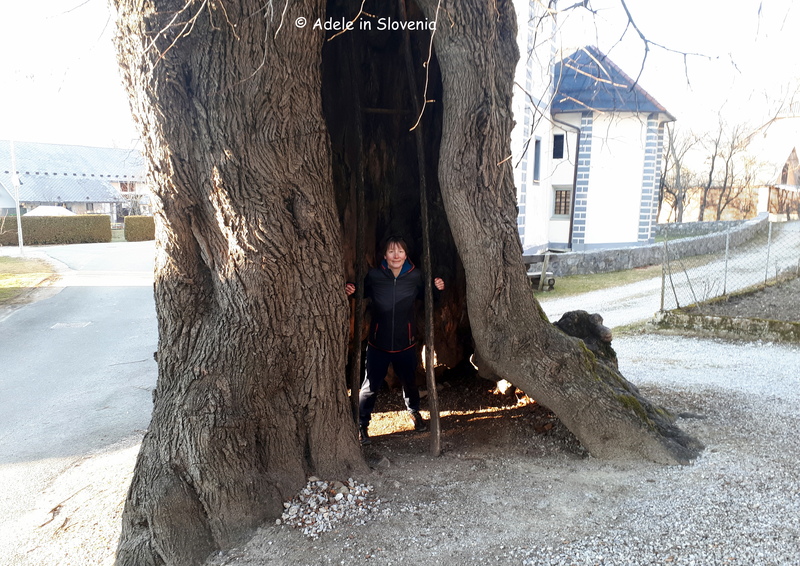 I already knew that April was going to be an indulgent month, and a heavenly one for a chocoholic like me – what with Easter and the Radovljica Chocolate Festival (see below for more details) both on the agenda. 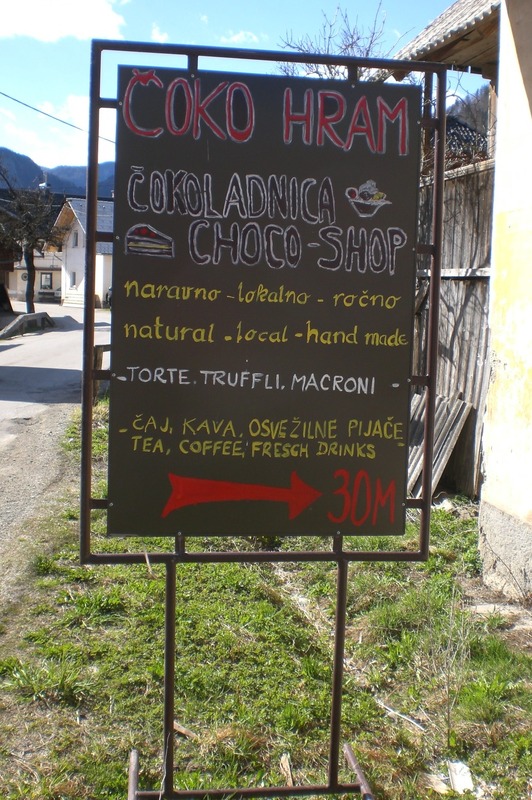 However, it just got even better when, on Friday, I discovered the cutest little café where they produce and sell the most amazing cakes and chocolates. Truly chocolate heaven for me! 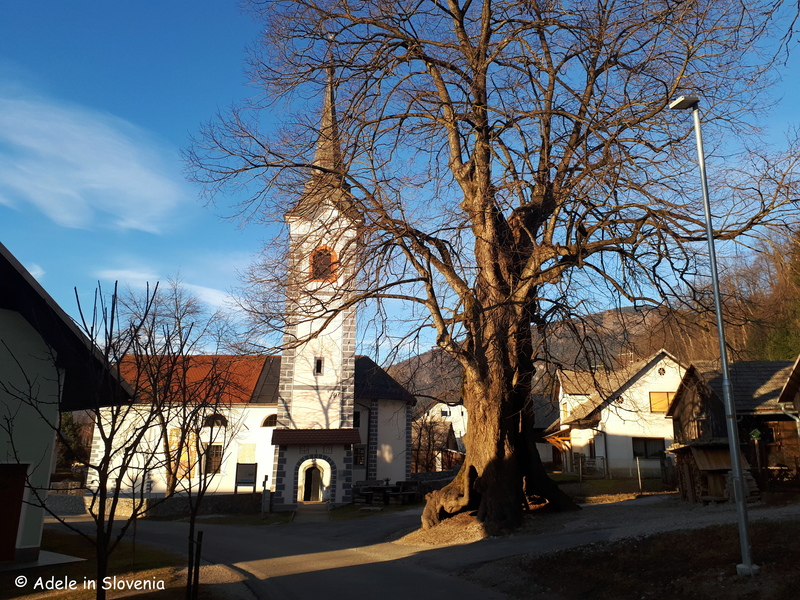 The place in question is Čoko-Hram in the tiny village of Bohinjska Češnjica near Bohinj lake. 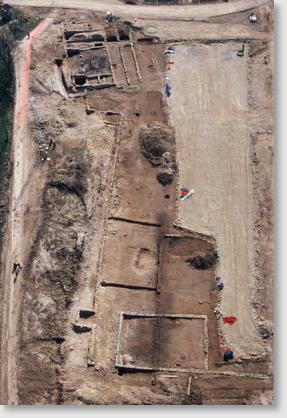 Blink and you could miss this place which, from the outside, belies what lies within. 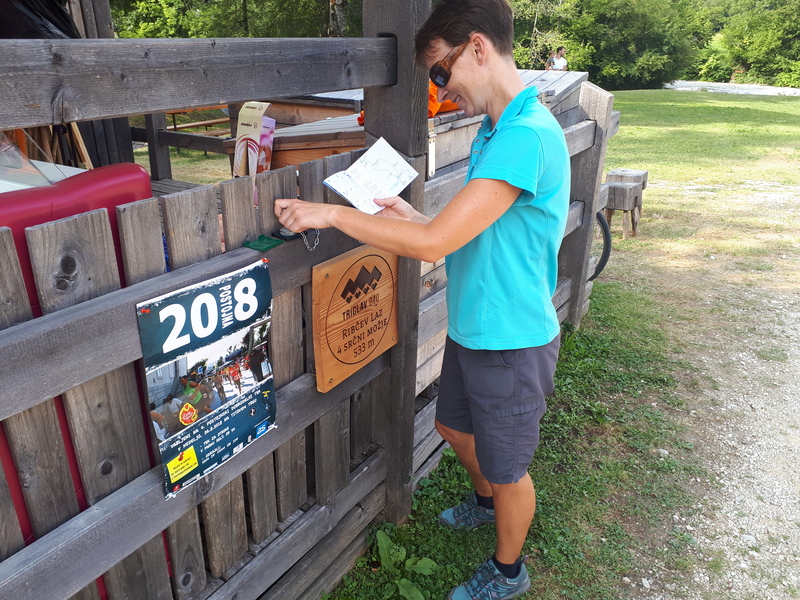 It is set just next to the road but a lack of good signage (new signs are being prepared!) means one could easily drive past, as I have done many-a-time, without giving it so much as a second look. But to do so is a crime – seriously – believe me! Once I stepped inside I was immediately charmed by the cute little chairs, tables, chalkboard drinks menus, and other homely touches; not to mention the glass chiller cabinet bursting full of delicious cakes and truffles, and the corner where home-produced chocolate, of all flavours, shapes and sizes, is displayed and for sale. So, as you can imagine, I had some serious tasting to do! 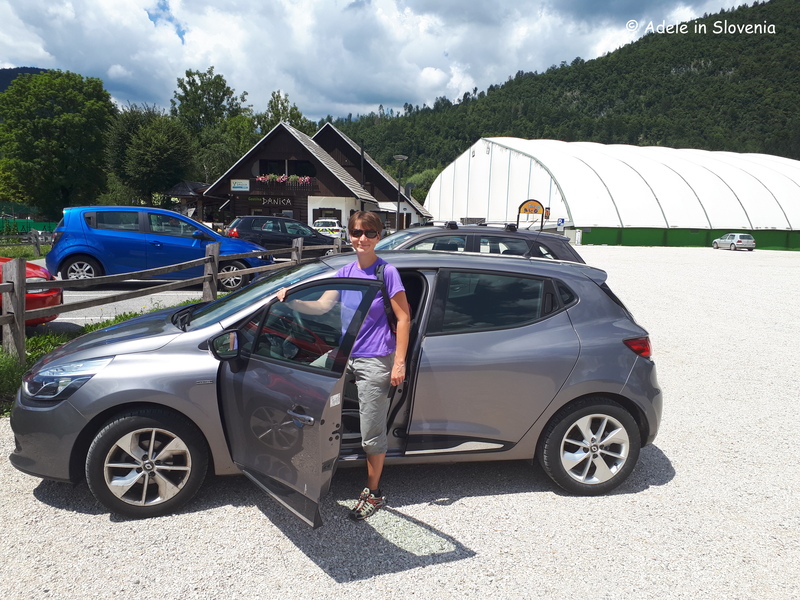 Now, I love strong cheese; stilton, extra-mature cheddar – the stronger the better – but I have always turned my nose up at Mohant, a local cheese from the Bohinj area which has an extremely pungent aroma. So, when I was offered a taster of a truffle filled with mohant, I wasn’t overly enthusiastic at the prospect, but I tell you, it works! The combination of the sweet white chocolate and the creamy mohant truffle centre is genius – although I can imagine it might be a bit ‘Marmite’ for some people i.e. you either love it or hate it! Another such daring flavour combinations is dark chocolate with zaseka (smoked minced lard no less! 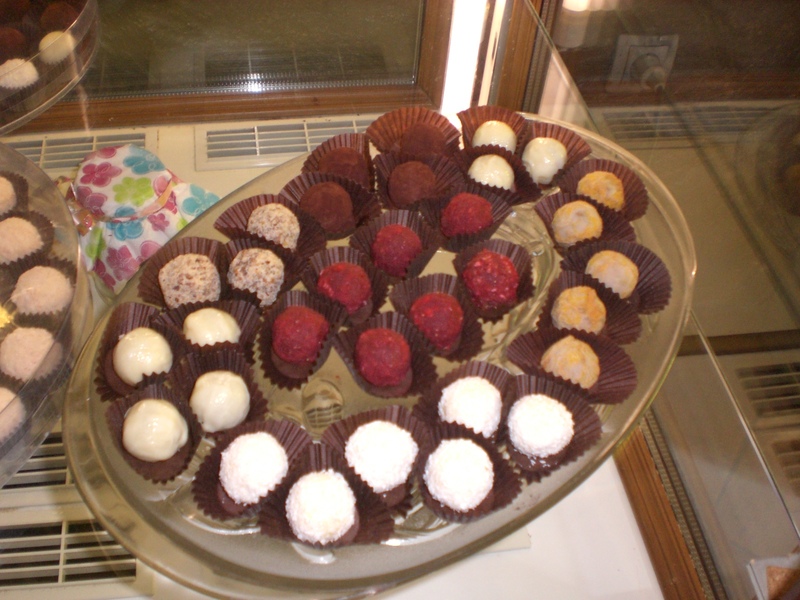 ), and others flavours and centres including tarragon, yoghurt, raspberry, honey-lemon-ginger, and many more. 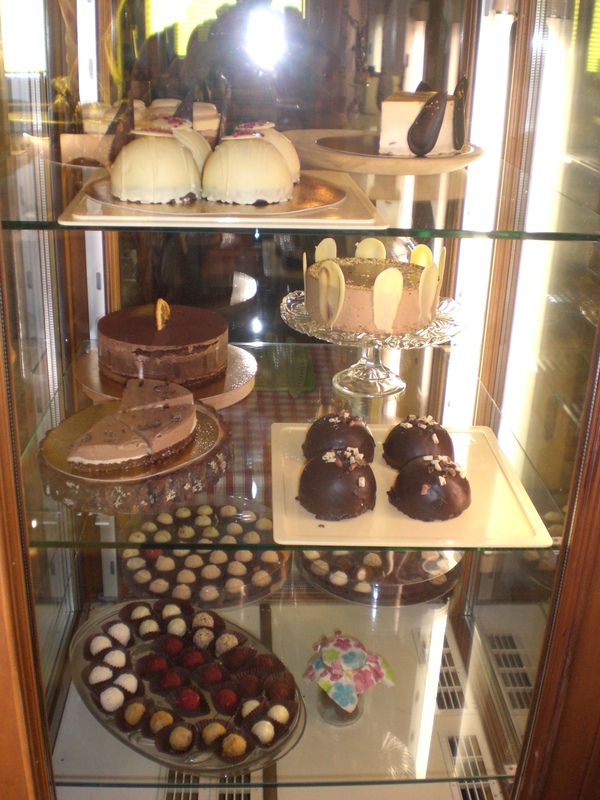 And then there were the cakes – oh the cakes! Where should I start? Perhaps it would be easiest to say, don’t just take my word for it, go and try them for yourself! 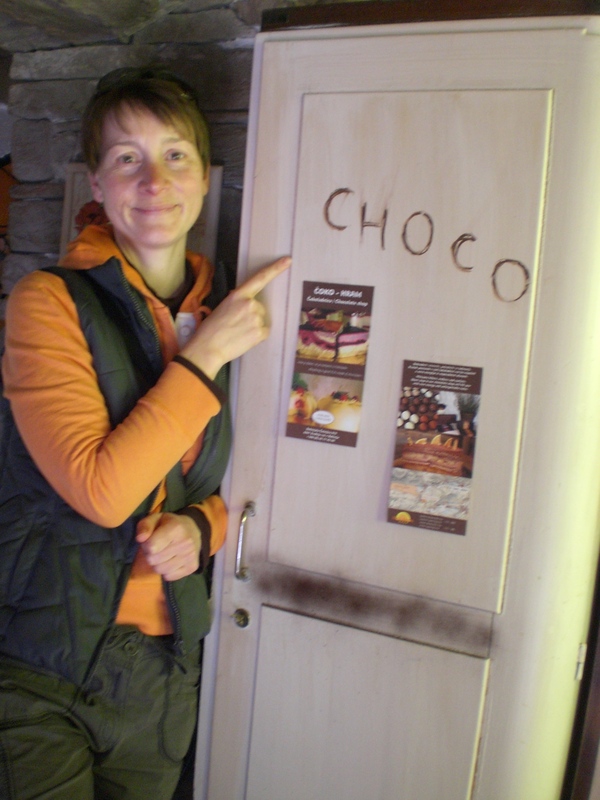 I have a feeling I will be writing a lot more about chocolate in the coming weeks! 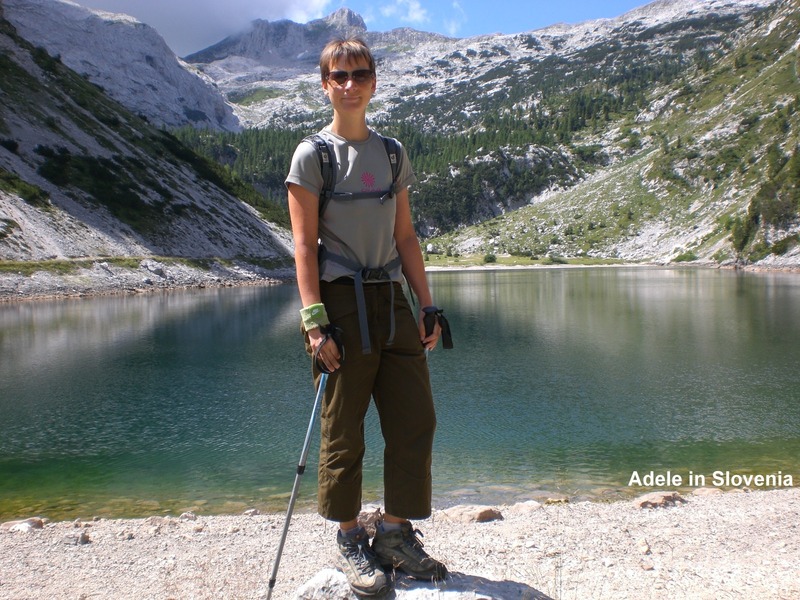 Hopefully, though, I’ll be offsetting all the indulgence with some hiking too, well if the weather plays ball that is! 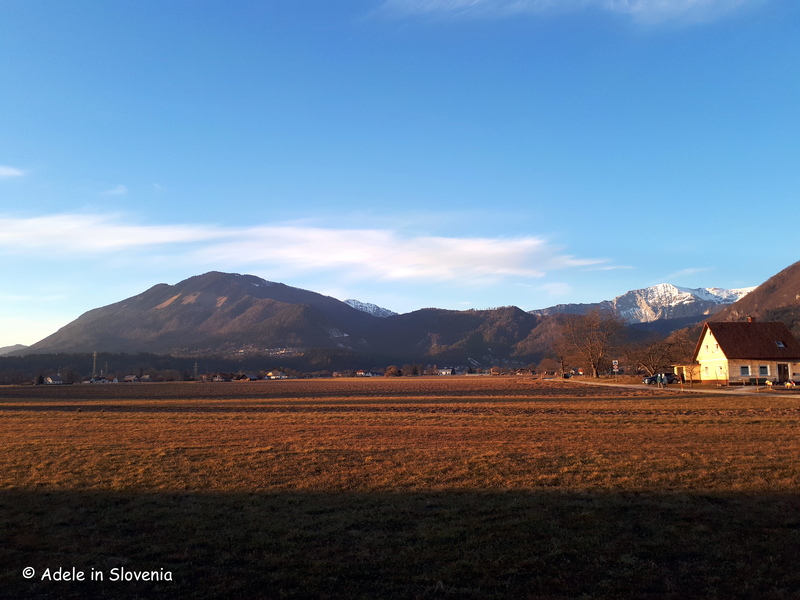 It’s been a relatively ‘unwintery’ winter’s week, with no extremes of weather – thank goodness – until yesterday when a rain storm made a, fortunately, brief appearance bringing with it more snow on higher ground. 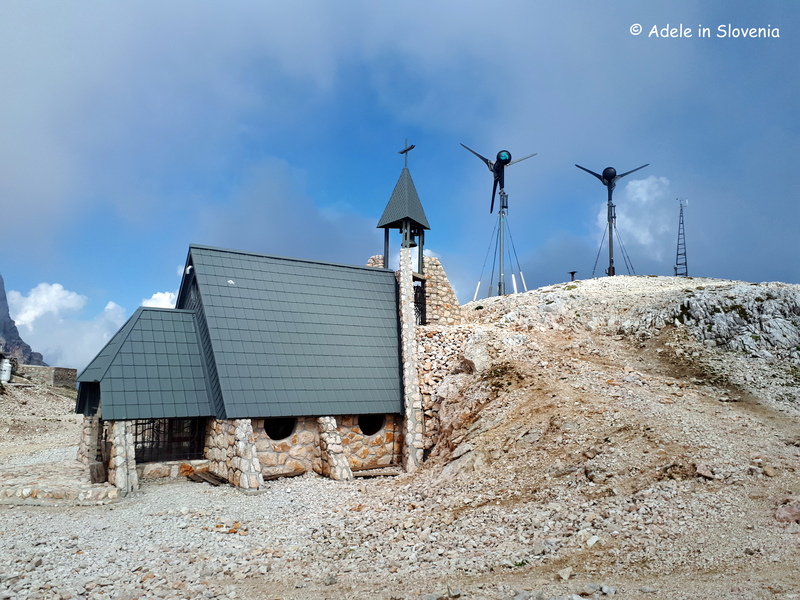 At the Kredarica mountain hut (Triglavski dom na Kredarici) a record-breaking gust of wind, measuring 221kmph, was measured on Saturday. 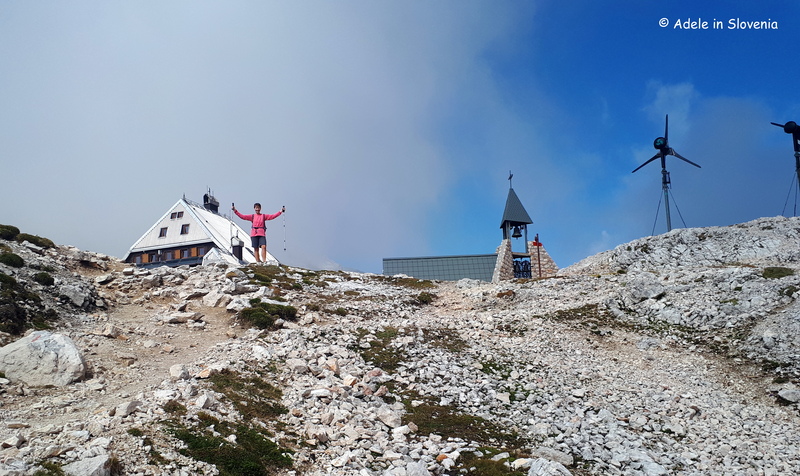 Kredarica is the closest hut to Slovenia’s highest mountain, Triglav (2864m), and at 2515m is the highest hut in Slovenia. 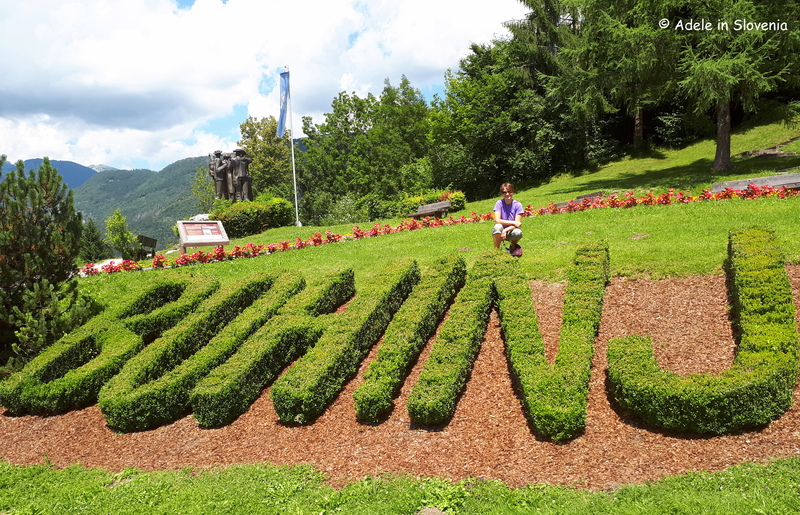 It is only officially open for a couple of months a year – usually from the end of June to the end of September – dependant on weather conditions, however, it is permanently manned by meteorologists. 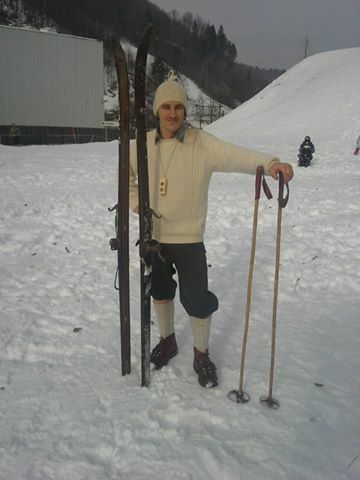 Talking of snow, last weekend saw the annual Retro Ski Race ‘The Koledniki Cup’ held in Kropa in the Lipnica Valley. 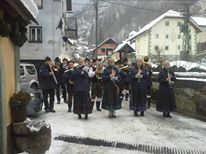 It is a competition which invariably involves a degree of humour as competitors try to demonstrate their skills using antique skis, clothing and equipment – which serve as a reminder of how far technology has come – together with an accompanying entertainment programme, culminating in the ‘Pig’s Head Cup’ ski jumping competition. 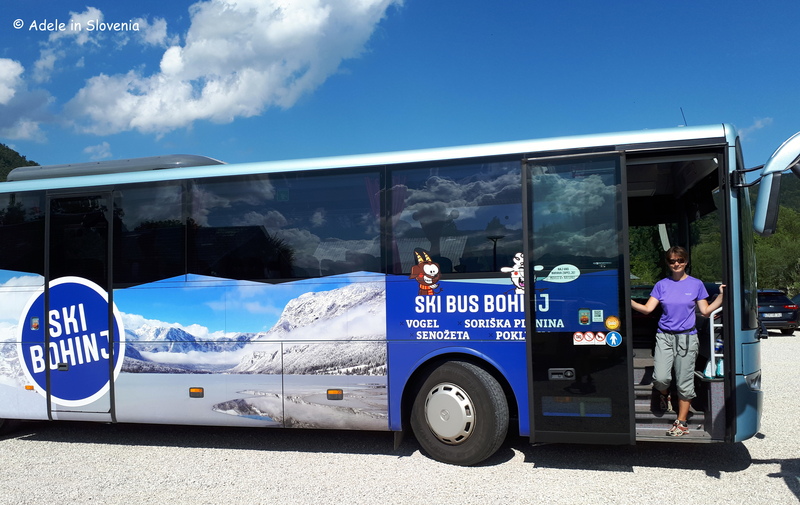 At 1611m the Vršič pass is Slovenia’s highest mountain pass and crosses the Julian Alps to connect the Gorenjska region and the Soča valley. 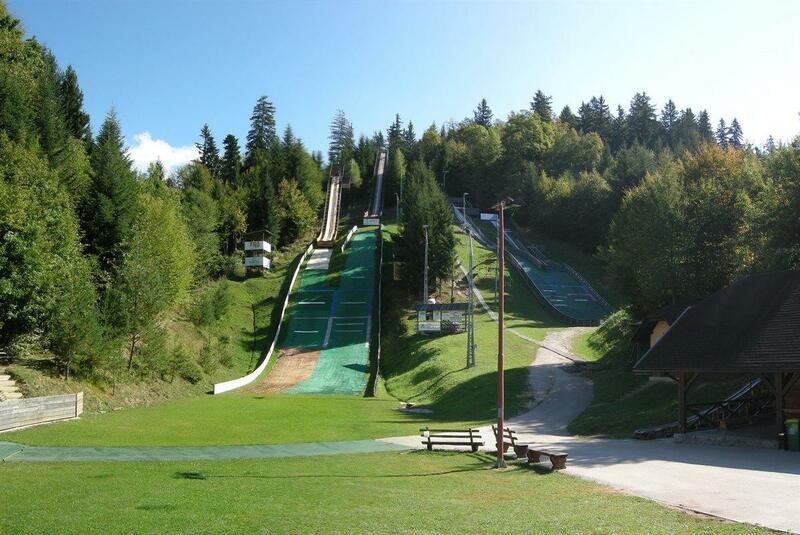 It has a total of 50 hairpin bends. 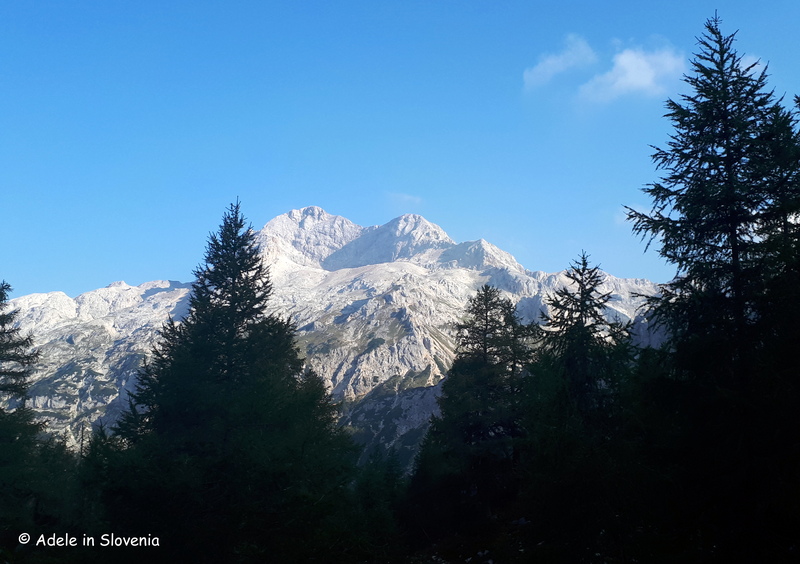 It is usually closed throughout winter due to snow and the risk of avalanches, however, it is very difficult to say exactly when it will open/close as it is dependant on the amount of snowfall. 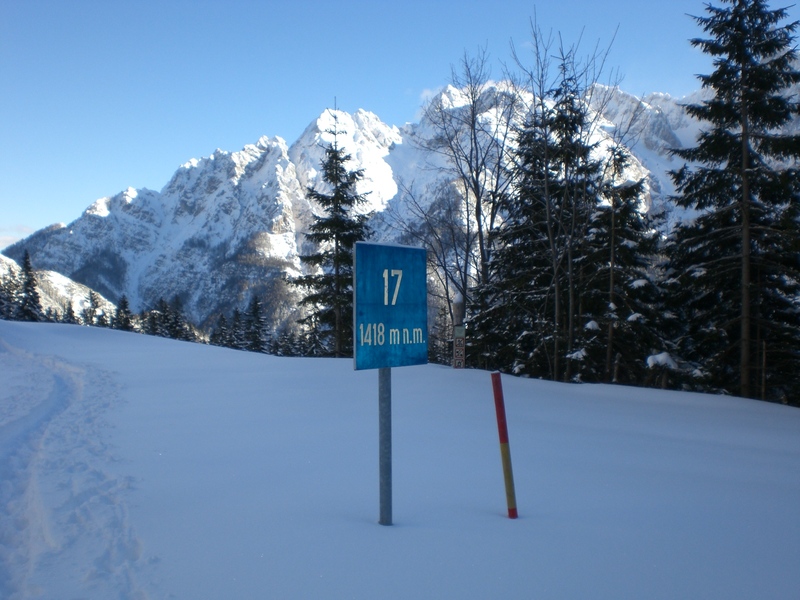 As you can see from the picture below, showing me standing on the ‘road’, taken last winter when I walked up to bend number 17 (read more here – https://adeleinslovenia.wordpress.com/2014/01/27/winter-on-the-vrsic-pass/), there is good reason for it to be closed! 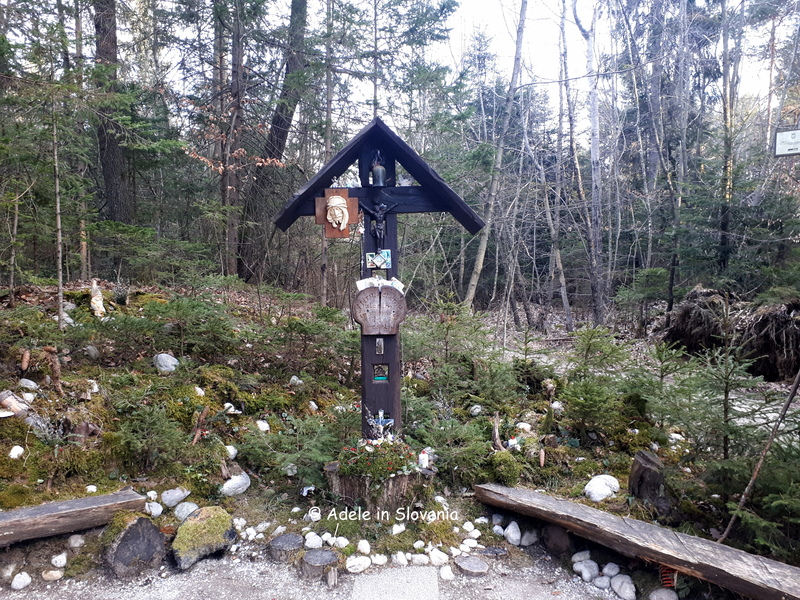 It is usually open at the latest by the start of May but it has also been closed until the end of May during years of particularly heavy snowfall and its also not unusual for it to then close again for a day or two if there is heavy snowfall, which is still possible in May. 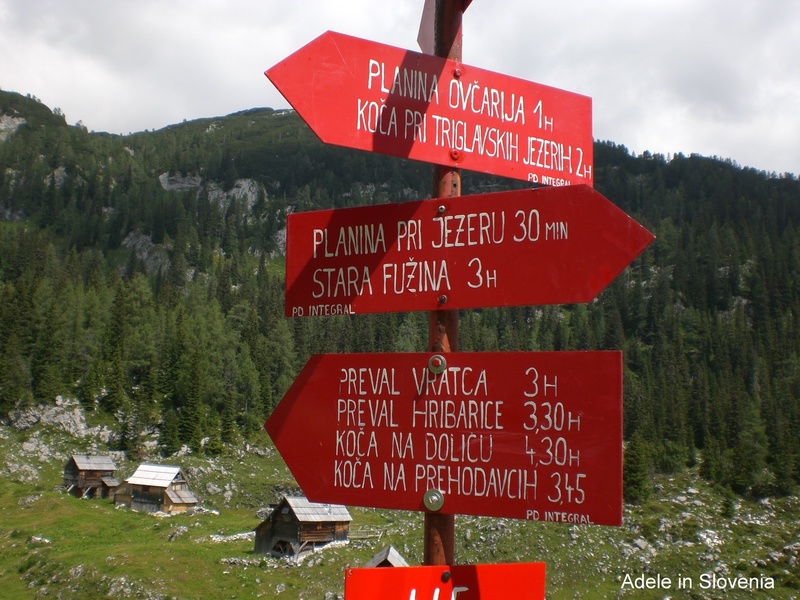 If you are planning a trip which involves going over the Vršič pass, then you should check the up-to-date traffic information (see Links to Tourist Information on the right side of this blog) and, if necessary, take the alternative route which involves continuing on past Kranjska Gora into Italy, then taking the Predel pass into the Soča valley. 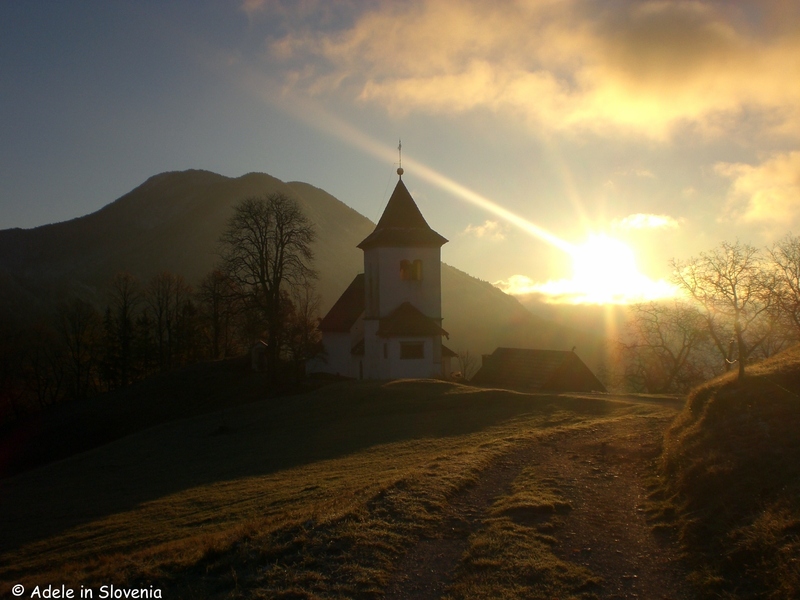 This is also a scenic route with plenty to see enroute, including the Kluže Fortress. So, I hope that answers that question! More to come….